Thank you for availing yourselves for this important media briefing to announce measures that are intended to bring about the long-term stability of the uMsunduzi municipality. We have just concluded a meeting with the Msunduzi Council, where I have delivered before the council a decision taken by the Provincial Executive Council. I wish to start at the onset by highlighting that this municipality as many of you are aware is a home of our Capital City and as such it is a pride of our province. It is therefore reasonable that all of us as citizens of this province expect it to lead by example when it comes to good governance, sound financial management and efficient service delivery. The people of this province look up to Pietermaritzburg as an embodiment of a well performing, well-governed municipality. It is our collective duty as National and Provincial Government to assist and ensure that it lives up to this expectation. We have just presented before the council measures to provide hands-on support and assist, not to point fingers and penalise, because we love and respect our capital city. Pietermaritzburg is the jewel of our province and we wish it to shine again. We have apprised the council of the Provincial Executive’s decision to intervene in this municipality in terms of section 139(1)(b) of the Constitution to restore this municipality’s functionality in terms of proper governance, administration and, by extension, service delivery. The intervention we have announced today is due to the inability by this municipality to hold its councillors accountable for deliberately absenting themselves from critical meetings and thus collapsing the quorum and rendering the Council dysfunctional. This municipality has also failed to institute consequence management measures for managers responsible for unauthorised and irregular expenditure. 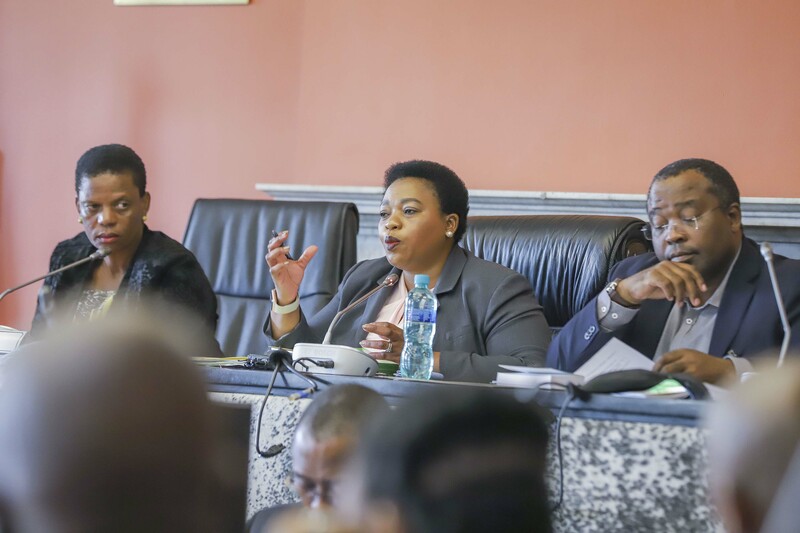 The Msunduzi Council has likewise failed to exercise oversight over management, with particular reference to the management of conditional grants resulting in under expenditure, stopping or threatened stopping of funds by National Treasury. The Council has further failed to exercise oversight over management resulting in the cash position of the municipality being overdrawn. The Msunduzi Council has additionally failed to implement consequence management measures against persons responsible for failing to maintain proper records, resulting, for instance, in the municipality’s non-disclosure of pension and medical aid deductions. The Msunduzi Council has also failed to resolve innumerable service delivery related challenges besetting the city, particularly waste management, roads and street maintenance as well as electricity services. And finally, the Msunduzi Council has failed to investigate allegations of malfeasance and maladministration against senior managers and other leaders of the municipality where necessary. It is against this background that we announce that with effect from today uMsunduzi is placed under intervention in terms of section 139(1)b of the Constitution, 1996. This means that the functions specified in terms of sections 51, 56 and 57 of the Municipal Systems Act as well as those related to financial management and service delivery, including project management will be done with the hands-on support of the provincial government. It has become clear to the provincial government that uMsunduzi municipality is no longer able, alone, to guarantee the provision of a sustainable services to communities without an intervention from the national and provincial government. To this end, we have appointed a ministerial representative to be based at the municipality who will prepare and implement a comprehensive recovery plan. Our ministerial representative will ensure implementation of financial systems, policies and procedures, including preparation and implementation of cost-cutting measures as well as implement governance systems and procedures, including oversight over the administration including ratification of decisions taken by the Municipal Council, the Executive Committee, Municipal Manager and Section 56 Managers. Specifically, the ministerial representative will establish and act as chairperson of the Interim Finance Committee to monitor and manage the cash flow of the municipality, to approve or disapprove purchase requisitions and to ensure that the municipality’s cash position is not overdrawn. This newly established committee will have to meet and report regularly to the Executive Committee of the Msunduzi Council. The ministerial representative will also ensure the implementation of remedial action plans dealing with negative findings from the Auditor General, including consequence management against managers and officials found to have caused unauthorised and irregular expenditure. Our representative will similarly ensure implementation of findings arising from any investigations into fraud or maladministration or corruption and to initiate new investigations where necessary. It is time for a fresh start in this municipality. After a long period of instability and poor results, the people of Pietermaritzburg deserve that we give them a municipality they can be proud of through our hard work and flawless performance. The challenge for us here is to make sure that this municipality will soon live up to its promise of maintaining infrastructure, including roads, managing waste and delivering basic services to its communities. Today I urged the elected municipal Council of Msunduzi to accept this new temporary arrangement and cooperate with our ministerial representative to ensure a smooth running of this municipality and its return to normality until this intervention is formally called off. It is our shared responsibility as two separate spheres of government to ensure that our capital city lives up to its designation as the City of Choice and that all its residents take pride in their municipality.